You may ask “Is it ok for me to sell an art, if I am selling technology or a pizza”. The answer is yes, yes and confidently yes. You can sell art irrespective of what business you are into. Here selling art does not means that you are trying to sell popular paintings rather you are trying to present your business information with great visual presentation. People have great penchant for colorful refrigerator art and they would love to retain it as long as they can. You can present your brand information in a very artistic and creative form over 4.5 x 5.75 magnets such that people cannot take eyes of it. They would remember your brand and appreciate it each time they are gearing up for some purchase. Art magnets would easily empower senses and influence peoples buying decision. Today, in the war of brands, people seldom remember the brand from whom they purchased the last, unless you give them something unique. Holiday wishes magnets 4.5 x 5.75 are becoming choice for marketers who wish to keep in touch with their customers and continuously remind them about their business. Studies suggest that 90% of people recollect the brand, which acknowledged offered them purposeful gifts. It is true that customers would remember your gesture of wishing them on the holiday during the next purchase. No one has time to read the branding literature that you may gift during tradeshows or other corporate events. Perhaps you can easily save on their efforts and give important information about your brand by gifting impressive full color 4.5 x7.5 magnets. These rack card magnets would allow you to stand out in the niche. People would find it easier to read the brand information printed over these customized magnets and make favorable impressions about your brand. Perhaps you know what do they mean, right! Discount, discount, and discount is a marketers favorite buzzword. They would love to use it for driving their sales and attract quality customers to their store. People love advertisers who give them benefit of savings and they would always remember this gesture with high priority. You can stay confident that one time discount coupon that you gift them would bring them back to your store more than often. Sending discount coupons to your customers is the perfect way of buying their attention and converting them into brand advocates. You can easily trounce your niche competitors with this goodwill gesture. Brand advocacy is becoming a serious commitment with marketers, who wish to add brand ambassadors rather than influencers. They have been doing it in many other ways such as rewarding customers for bringing referrals, or offering savings on adding new friends to the website, etc. You can seriously experiment this type of marketing over customized 4.5 x 7.5 magnets. You can employ them for brand advocacy by printing with information of purpose. People would not mind retaining a promotional product, which gives them a reason to remain loyal to the brand forever. 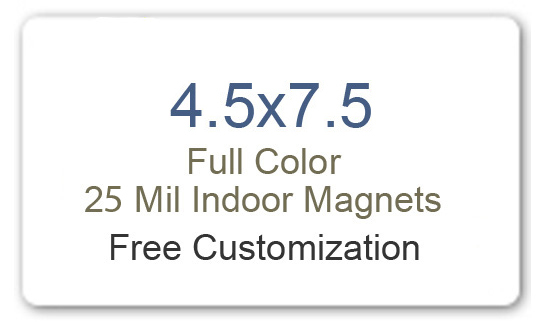 You can easily find many other ways of promotions and value building through custom 4.5 x 7.5 magnets. Remember long-term exposure is the key to survive in the intensifying niche competition.